This may be the oldest printed piece of WJMA history found thus far. The card is post marked "8:30am Nov 10, 1949". That's just one month after WJMA signed on the air. 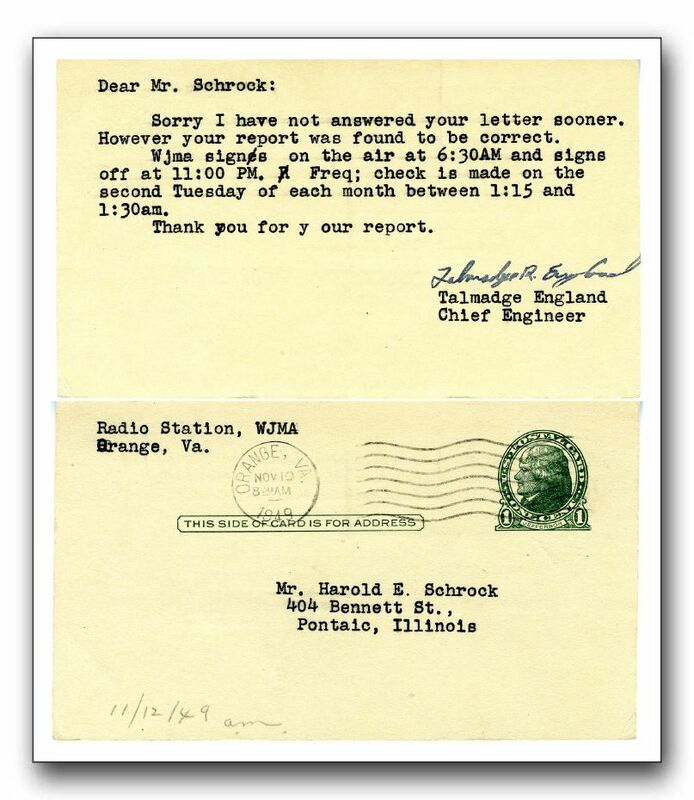 Note that the "QSL" card was addressed to someone in Illinois who had picked up the station at night. QSL cards are were often sent to AM radio stations by listeners who tried to tune in distant stations. In 1949 WJMA operated with just 250 watts of power. Normally it would have been hard to hear the station more than 10 miles away. After leaving WJMA Talmadge England had a distinguised career in the nuclear energy industry. He wrote a computer program that is still in use today. There's more about him on his web site. For more on QSL cards, visit this Wikipedia page.